If you have tickets for the Bristol Hippodrome or a train to catch at Temple Meads then this low-cost hotel is a persuasive option. 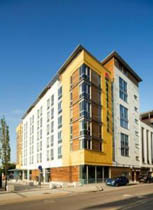 The Ibis Temple Meads provides low-cost bed & breakfast accommodation in a fairly confused and chaotic area of town but given its proximity to Temple Meads Station the hotel offers a surprisingly calm and lush environment for kicking back and relaxing during gaps in your hectic schedule. Situated just east of Castle Park and within walking distance of the Floating Harbour, the Ibis boasts the kind of attention to detail that would make many a 5-star proud - making it incredible value for money. Its bright and cheerful colour-schemes may not be to everyone's tastes and the actual floor space of some of the bedrooms may not be generous by Malmaison or Radisson standards but their intelligent and minimal design creates an impression of space at the very least. The onsite bar and restaurant adopts a similar attitude: sparse, functional and with furnishings and colour-schemes that wouldn't look out of place in a Star Wars movie. This modern, ultra-nouveau doesn't always work but in the context of no-fuss budget lodging it works surprisingly well. A pleasing fusion indeed.